I didn't have very many goals for March because I was pretty ambitious for February and failed miserably. I figured it's better to set goals that I know I can do if I put my mind to it. Go to church twice this month and decide if we want to stay or start visiting other churches. We went to church twice this month. I wound up sending Cecily to the nursery today, which definitely helped because we weren't constantly having to entertain her. 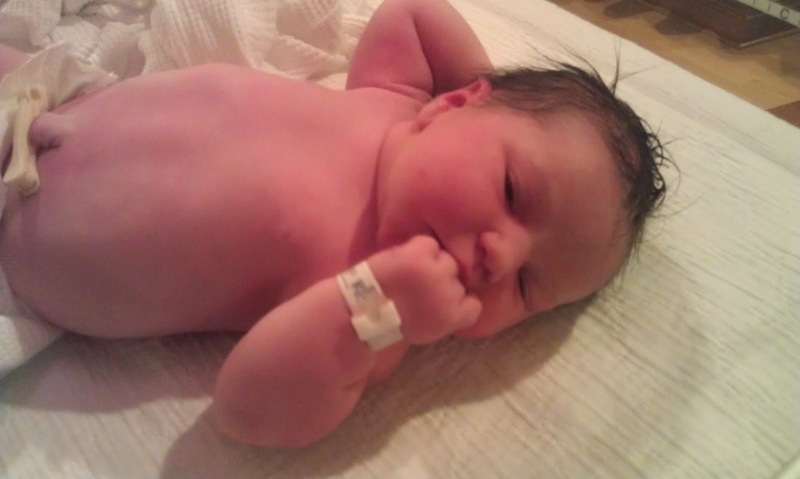 I think we will try to put her in the nursery each time we go from now on. Get Ewan registered for preschool. Done! Get our hotel booked for our vacation. We did this last week. Meal Plan every week. Surprisingly this did happen. I posted meals each week on the dry erase board and made all of them. Get back to going to the gym three times a week. Ha! While I did go to the gym, it definitely wasn't three times a week, more like three times a month. I did, however, ride my exercise bike at home at least twice a week. And I just realized I accomplished all but one of my goals...victory! Continue to meal plan every week. Go to the gym/ride the exercise bike/walk around the neighborhood three times a week. Stay within our grocery and eating out budgets. These both were completely blown in March. Must do better this month! Finish getting the yard cleaned up. Figure out our vacation itinerary. Don't forget to link up your goals for the month of April! A few weeks ago, I posted about several things I had cooked/baked lately. Due to the large positive response to my monster cookies, I decided to post the recipe. Enjoy! 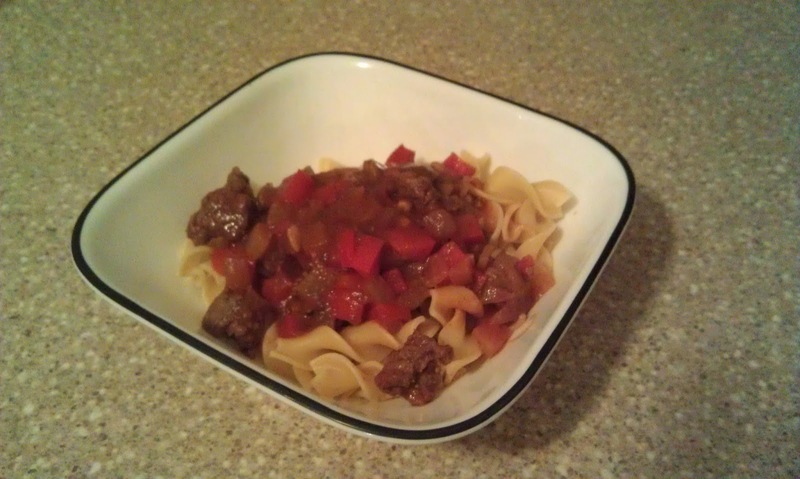 I used a recipe from my University of Evansville cookbook and added some ingredients to make them a little healthier. So I spent the majority of the service at church this morning almost in tears. There was a paper in the bulletin today about donating Easter flowers in memory of someone and all I could think about was my grandmother. Not Easter lilies, but daffodils from my backyard. My grandmother loved spring and Easter. My mom or one of my uncles would always get her an Easter lily and she would donate one in memory of my grandfather to church. All I could think about was that I had no one to get a lily for this year, which reminded me of how much I miss her. I honestly don't talk about her much, to friends/family or on here because I usually end up bawling if I do. I happened to look at photos of her around this time last year here at our house, so vibrant and full of life holding Cecily and it broke my heart to be reminded yet again that she's gone. The previous owners of our house loved flowers and had awesome landscaping. So of course our entire yard is one giant bloom from April through June. We've been spending a lot of time outside lately as the weather has finally started to warm up and I'm enjoying looking at all the signs of life going on in my yard. Except that , yet again, they're reminders of my grandma and how much she loved this time of year. So this morning I had an epiphany. I'm starting a new tradition: donating flowers to my church's Easter service in memory of my grandmother. Even though we will be at my in-law's this year, it's my small way of letting her know that she's loved - and missed. My last time co-hosting Fantastic Friday for March. I hope you've enjoyed linking up as much as I've enjoyed hosting! Each week Michelle from The MaMade Diaries sends out an e-mail notification that the Fantastic Friday Link Up is live. If you'd like to stay up to date with the link up and receive the reminder e-mails so you can be one of the first people to link up, you can sign up below. Sign up for Fantastic Friday Link Up e-mails! The first area below is for you to link up your Bloglovin' profile. Please be sure that you are not linking to posts or your blog homepage. Any posts that are linked up in this first section will be deleted. If you have a great post you would like to link up, please come back to The MaMade Diaries on Tuesday's and link them up at the MaMade Blog Hop. 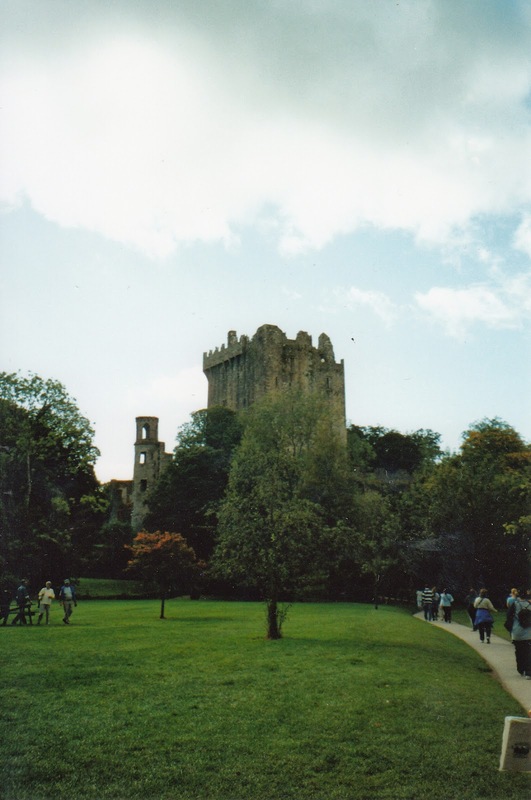 I know that St. Patrick's Day was last week, but since The Boys Behind the Blog also happened to fall last week, I figured that a week late is better than not at all, so this week's Travel Thursday is about one of the most famous places in Ireland, Blarney Castle. The current Blarney Castle was originally constructed in the 1400s but is now in ruins. 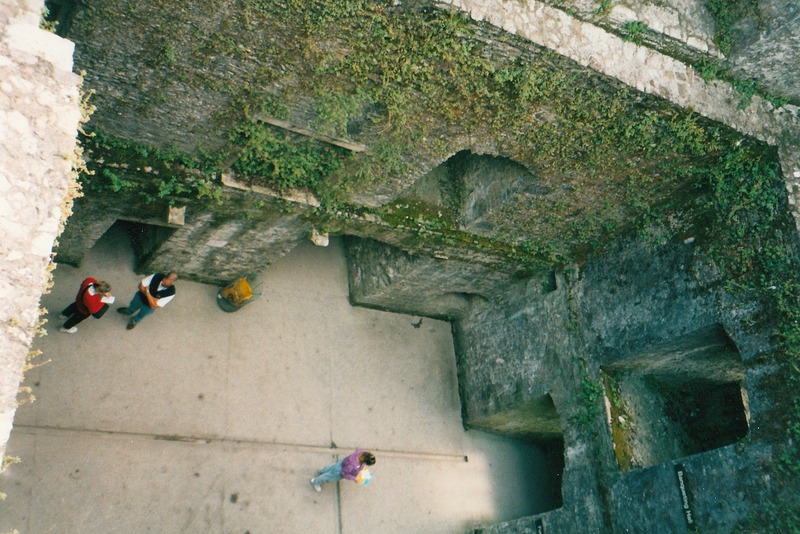 We all know why Blarney Castle is famous - the Blarney Stone which gives you the gift of the gab if you kiss it. But, did you know that the Blarney Stone is supposedly part of the Stone of Scone, which was historically used as the coronation stone for Scottish monarchs. It's last use for this purpose was for Queen Elizabeth II. Edward I took it from Scotland to England and it only recently went back to Scotland, within the last 20 years, where it stays with the Scottish Crown Jewels at Edinburgh Castle until the next coronation. 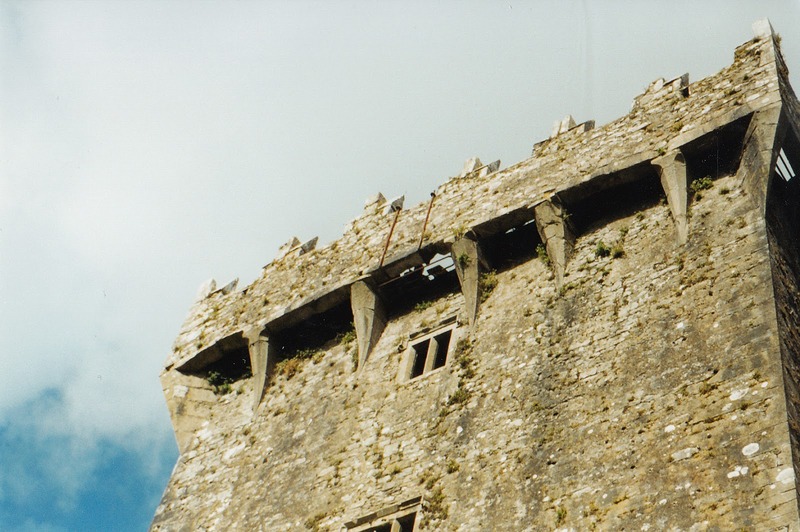 The stone is set into the bottom part of the parapet, where the metal brackets are at the top of the keep in the above photo. It's pretty high, so if you're afraid of heights like me, it was an adventure! This photo shows just how high you are. You lie down on the rampart and lean backwards down to the stone to kiss it. That's scary enough, but even more so in the middle of a rainstorm! I thought Indiana weather was crazy, but it went from sunny and beautiful to pouring down rain in about five minutes while I was waiting my turn! Alan really wants to visit Ireland at some point and I know we will visit Blarney Castle. Hopefully when we do, we'll get to visit the gardens too! I received this book for free in exchange for a review. However all opinions are my own. Before kids, I used to read all the time. Now I hardly ever get the chance to sit down and read a book - I only read one book in 2013 and that was only because I was able to read in the evenings when I was out of town for work once. You cannot believe how excited I was when I found out I was getting the opportunity to review a book because it meant that I would finally get a chance to take the time read. While I do read history books for fun, I usually lean towards chic lit when reading. But, in an effort to expand my horizons, I decided to read A Story Unfinished: 99 Days with Eliot, the story of Eliot Mooney. Eliot is the son of Matt and Ginny, who found out when Ginny was 30 weeks pregnant that Eliot had Trisomy 18. Most of us know that Trisomy 21 is also known as Down Syndrome and that it's possible for many born with Trisomy 21 to live until adulthood. But almost all of those born with Trisomy 18 don't make it past the first week of life. If they're born at all. Eliot lived for 99 days. Matt takes us through Ginny's pregnancy, Eliot's life and his and Ginny's life after Eliot's passing. As a mother parent, I cannot imagine the anguish they must have gone through and how much they miss their son, though Matt does a really good job of explaining how they felt. Through it all, they never lost their faith. If I want to be perfectly honest, I don't know if I could do it if I lost a child. There are so many things that hit home with me due to my recent loss of my grandmother and I am so glad that I read this book when I did. Regardless if you have personally experienced loss, you will learn something from Eliot. I'm an Off the Shelf blogger, a program from Beacon Hill Press the leading provider of Christian books. Basically, I get to review their books. It's not something I talk about much, but one of the things I am wanting to do this year is strengthen my faith and this is a great way to do so in addition to making the commitment to attend and become more active in our church. I have always wondered if the trauma of my labor and delivery with Ewan has affected his personality to an extent, especially compared to my labor and delivery with Cecily and her personality. There was a thread on a birth board recently asking if anyone else noticed this and the number of comments stating that their c-section baby is incredibly independent, sensitive, emotional and tempermental was astounding. Maybe there really is a correlation. That would explain things about me as I am also very independent, emotional, sensitive and definitely tempermental. And I was a c-section baby after my mom's traumatic labor. I had gallbladder attacks while pregnant with Ewan and coupled with my horrible birth experience and subsequent c-section, plus breastfeeding difficulties, I was very very stressed for most of my pregnancy. 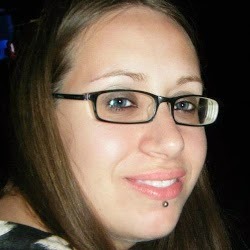 With Cecily, the experience was pretty much the exact opposite and for the most part, she is very easy going. I did a brief Google search on this and didn't come up with much other than how to deal with needy children. But, from my own experience and from reading that of others, I really think there's something to this. If your pregnancy/birth experience was stressful/traumatic, there stands a good chance that that child might be a little more high strung than a child that was born of a less stressful pregnancy/birth. It makes sense because you release cortisol when you're stressed and the baby can feel and experience that too. Do you think there's anything to this? Can you believe that we're already going into April?! I thought 2013 flew by, but it seems like 2014 is as well. Since it's the end of the month, you know what that means! It's sponsorship giveaway time! In March, I gave away my sponsor spots as a part of my White House Black Market Giveaway and as part of an ad space giveaway on another blog. But for April, I'm getting back to what I originally wanted to do this year, giving away my sponsor spots to my readers each month. Please enter through the Rafflecopter below. Good luck! Yesterday was the first day of Spring (and my friend Sheena's birthday!) and I cannot be happier. I love cold and snow, but this winter has seemed to be exceptionally harsh and I have been ready for some warmer weather and spring flowers for weeks now. Eating dinner outside on the porch last weekend. 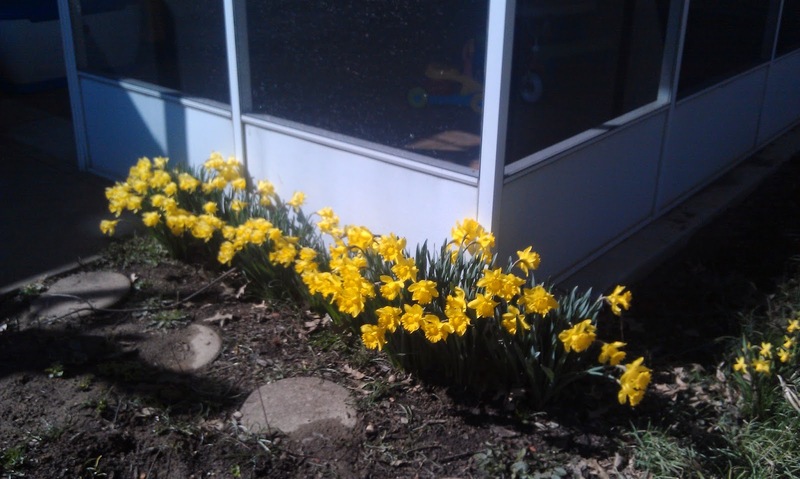 My daffodills are blooming and the hyacinths, tulips and iris are coming in too. Woot! We've been slowly trying to clean up our yard this month in anticipation of summer and I cannot wait to get started on my herb garden. It didn't get completed last year and Alan has promised me he will get it done this spring so we can have beautiful and fragrant herbs all summer long. I cannot wait! Bring on the evening walks around the neighborhood and trips to the park! What are you most excited about this Spring? Don't forget about my Heroes of the City giveaway that ends 3/26! I'm really loving that I have been able to co-host this month. It's allowed me to find a great bunch of new blogging buddies! 1. What's your lucky number? We'll say 423 for the sake of having an answer to this. 2. Do you have a lucky charm? Nope. 3. Do you fill out a bracket for March Madness? Who do you want to win? Not usually, but I did this year. We all filled out brackets in the office and he chose Louisville to win. 4. March 10th is "Middle Name Pride Day." What's your middle name? Really? He goes by his middle name! 5. Submit one question that would would like to see on a future The Boys Behind the Blog. That would be like cheating on a test, and I would never cheat. Don't forget about my Heroes of the City giveaway that ends on 3/26! 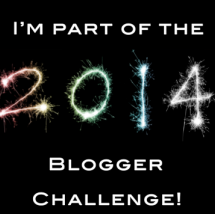 So, I've been doing this #2014BloggerChallenge this year and one of my posts was about historic preservation. Alan told me that he thought I should find a way to make each challenge post about preservation and came up with a great idea for the next post, which was all about nails. While I already had a post for that particular challenge, I decided to go ahead and write out my historic preservation post all about nails...here it is! Did you know that you can date a building's construction by the type of nails used in its framing? There are three main types of nails, hand wrought iron nails, machine cut nails and modern wire nails. Hand wrought iron nails were used from the 1600s through the early 1800s and were expensive. They were mainly imported from England until after the Revolutionary War. These nails came in many different shapes and sizes and you can tell that they’re hand wrought because you can see the hammer marks. Machine cut nails came into use around 1790 and allowed for nails to be manufactured on a much wider scale. Thomas Jefferson even bought a cut nail machine. 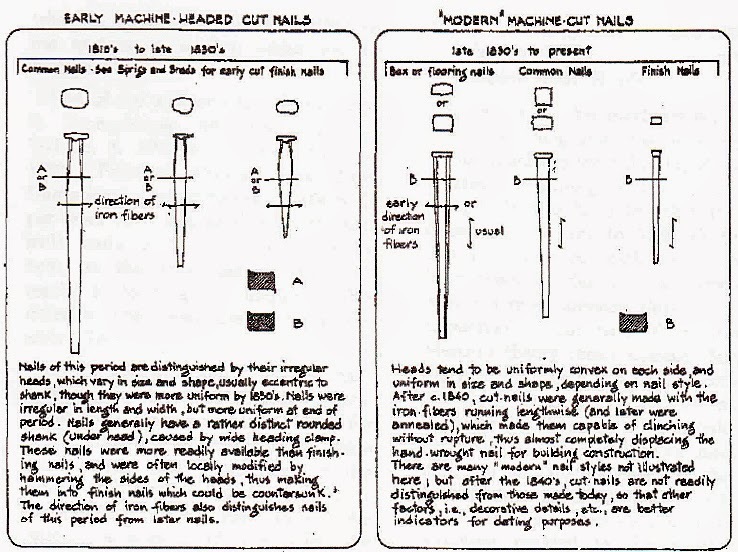 Machine cut nails started out with just the nail portion being cut from a machine and the head was still man-made and hammered onto the nail. Starting around 1815, the entire nail was cut from a machine. These nails were more square than rounded with irregular or square heads. They were also made with iron. 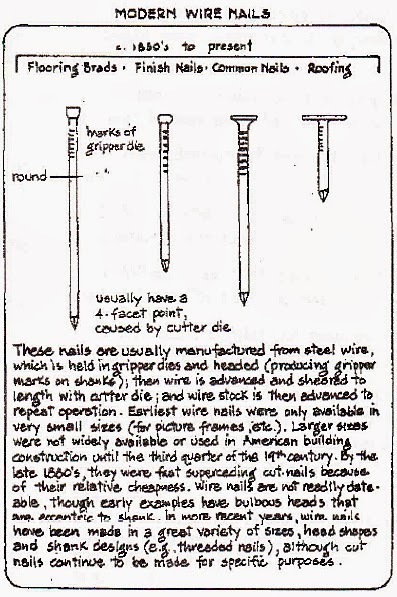 Wire nails were developed in the 1850s in the United States and were originally used for things such as cigar boxes. They’re made from steel wire and came into preferred use during the 1890. They were made even more cheaply than cut nails and are the nails that are used today. So there you have it. 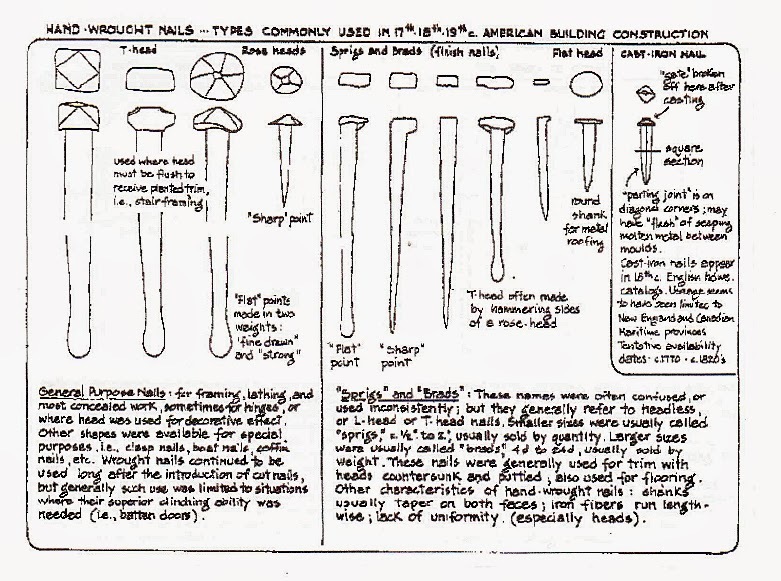 By knowing the type of nails used in construction, you can get an idea of when a building was constructed. I know, I know. Why would you ever want to know this unless you work in construction, are an architect, an architectural historian or archaeologist? Well, I really don’t know…in case you’re ever on Jeopardy? I just thought you might find it interesting to see some of what I need to know to do my job. What random knowledge do you need for your job? The last three weeks I've been telling you about how I save money buying organic by buying local, food preservation and couponing. Now I'd like to talk about something I think a lot of people don't always think about. Purchasing in bulk online. I'll be honest, I only do this every couple of months and it's usually for paleo cooking items or sometimes produce. But, what I spend that month in buying those items in bulk results in savings over the next few months since I'm not constantly running to the store to buy expensive coconut oil and almond flour, for example. There are numerous places to buy organic items online, but here are a few of my favorites. Azure Standard is probably my favorite place to purchase organic goods online. You can purchase monthly if you choose and it is delivered via semi to a drop site nearest you. We have a drop site here in Evansville so I am able to do this whenever I want, which usually is every couple months. There are discounted items in every category you could think of, from produce and dairy to dry goods to bath soap. It's the cheapest place I have found bulk almond flour too. I joined our group here a couple months ago and absolutely love it. Vitacost is another site you can use to order pretty much anything organic at a discounted price. Except this time it's shipped directly to you. I have only ever browsed this site but I know lots of people who purchase regularly. They usually order together to get free shipping. Abe's Market is a site I have used a couple times to order organic items. I like to get their Discover Natural Box for $5 where I get to pick three samples. It's a great way to get items that you don't need a whole lot of something, such as hemp seeds for example. Tropical Traditions is one of my favorite sites to order from. If you've been around awhile, then you know that they are the best source for coconut oil, coconut flour and other organic products. I subscribed to their newsletter so I get updates on all the sales, which are almost always going on and have been able to get two free 32 oz jars of coconut oil with purchase. Which is awesome. Amazon isn't a site that I would've ever thought about using to purchase organic products until one of my co-workers said she buys Bob's Red Mill Gluten-Free Baking Flour in bulk off of the site.Once I started looking, I realized that there is all sorts of stuff that we would use. You can also join their subscribe n shave program to get a deeper discount. Just be sure to remember to cancel your renewal purchase if you don't want more gluten free baking mix headed your way! Does this take a little time to figure out where's the cheapest place to purchase organics? Yes, at first. When I needed to purchase something, I would take a quick look at Azure to check prices then compare with Amazon, Vitacost and store prices before deciding to purchase something. Now that I've been doing it awhile, I have an idea where it's going to be cheapest. It's worked out well almost every time! I'm so glad that I get to co-host this month! Please join us for Fantastic Friday! Kids have lots of clothes. While they are tiny, that doesn't make them any easier to organize! Since kids grow so quickly, you need lots of clothes in lots of sizes. Add in clothes for the change of seasons, hand me downs and saving clothes for your next child, and you may soon be over run with adorable outfits! I wanted to give you some tips on ways and techniques to store and organize all those clothes. 1. Pick a time to sort. If you don't put it on your schedule, you will never find the time. Some people like to have kids around to help. Others, prefer to get a babysitter so they can organize in quiet. 2. Have piles set up. I love using large Ikea bags to sort. Toss, donate, sell, and keep or store for a younger child are common groupings. 3. Closet dividers are a great way to separate sizes. I love these from The Container Store. 4. Use drawer dividers. Kids' clothes are tiny and if you simply fold and put them in drawers, you are going to lose items and overwhelm the space. 5. Likewise, I suggest shelf dividers. 6. Installing a second closet rod is a great way to give yourself more space. When your child gets bigger you can use it for storing shirts or you can remove it all together. 7. If you are going to move the items out of the bedroom or closet, I suggest storing them in small plastic shoe boxes. This way, you can easily see what is inside and create grouping of like items. I suggest rolling the clothes or folding and then storing vertically. 8. One of the most important things to remember about kids' clothing is that you will have more than you need. Donate what you don't love or your child isn't comfortable in. 9. If you are keeping clothes because they are sentimental, store those in a different spot than the clothes that are going to be worn again. Consider taking photos of them and then donating or making a quilt out of them. You can even use them as the matte in a framed picture. 10. Get kids involved with folding by giving them an easy to use flip folder. This also makes all of your piles uniform. I received this product in exchange for a review. However, all opinions are my own. 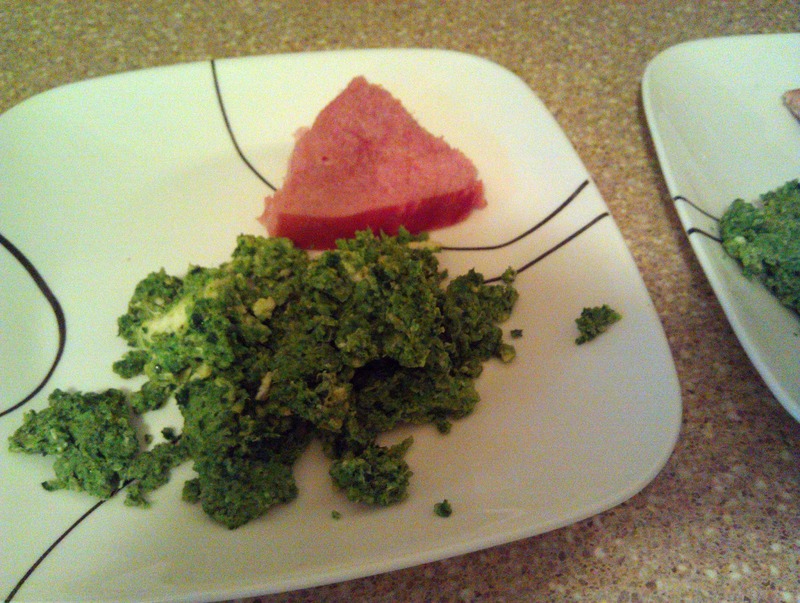 I was lucky enough to be contacted recently by Vital Proteins to try their grassfed beef gelatin. I don't know if I can convey to you how excited I was by that email. I know, the one thing you're probably asking is why would I be so excited about gelatin? Well, gelatin is SO good for you. It's made up of collagen, the most abundant protein in the body and is necessary for all connective tissues in the body. Collagen is necessary to rebuild joints and helps to firm your skin. As a mother who has had two babies, let me just say that my body definitely doesn't look like it used to. I love that by taking gelatin, I'm helping to firm up my super stretched stomach. It's recommended to dissolve a scoop of gelatin into warm water and drink daily. But, if you're like me, the thought of drinking straight gelatin is a little gross. Good thing that there's so much you can do with it. Gelatin can be added as a thickener to soups, it can be used as a thickener in whipped cream, to make marshmallows, fruit juice gelatin and fruit gummies, just to name a few. As an added bonus, it's kosher and gluten free. It's also one of the main ingredients in bone broth, which is a staple when you're eating paleo. I've played around with gelatin before, but let me just say that when I added Vital Proteins grassfed beef gelatin to chicken soup I made over the weekend, it was the best batch of soup I had ever made. I had intended to bring it to lunch at work this week, but let's just say that it didn't make it. If you have never tried real gelatin before, I highly recommend it! You can find Vital Proteins on Facebook, Twitter, Pinterest and YouTube in addition to their website.